Should Cabinet minutes remain in the closet? FOI Man challenges the claims of the Lord G.O.D. and his exalted predecessors that FOI threatens good government. 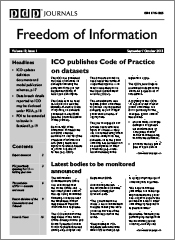 So what sort of change do FOI’s critics envisage? At the moment Cabinet Minutes (and related discussion) are protected by section 35(1)(b) of the Act. Section 35 is a class-based exemption. This means that there is no prejudice test, as there is for, say, section 36 (prejudice to effective conduct of public affairs). Cabinet Minutes and other ‘Ministerial Communications’ are exempt from disclosure because they fall within that category. Whenever an appeal relating to this exemption ends up with the Commissioner or Tribunal, they usually uphold the application of the exemption to Cabinet Minutes and their like – they either are, or aren’t, Ministerial Communications. However, the exemption, like many others, is subject to a public interest test. On the rare occasions where the Commissioner or Tribunal have ruled in favour of disclosing Cabinet Minutes, they have argued that the Cabinet Office have judged the public interest incorrectly. So in effect, it’s this aspect of the Act that critics want to change. They want the exemption for Ministerial Communications to be made absolute (or perhaps for a new narrower absolute exemption for Cabinet papers to be introduced), so that a public interest test won’t apply. This is the same change that was made to the exemption covering correspondence from the monarch and her heirs in 2010. (It’s worth pointing out that whilst it might be possible for the UK Government to introduce an absolute exemption for Cabinet minutes under FOI, discussions at Cabinet relating to environmental matters would be subject to the Environmental Information Regulations (EIR). Exceptions in the EIR are all subject to a public interest test, and since the regulations are based on a European Directive, there is little likelihood of changing them in this way). To be fair to those who want this change, it would not be an entirely unusual approach to Cabinet Minutes. Most countries have some level of protection for Cabinet minutes or their equivalents. In Ireland, Cabinet Minutes are protected by an absolute exemption, though this is tempered by the fact that this protection is only available for ten years (in the original Irish Act it was 5 years, but this was later amended). But in New Zealand, for example, the Government has to demonstrate that the convention of collective responsibility would be prejudiced by disclosure, before also carrying out a public interest test. So let’s look at the key arguments against disclosure of Cabinet minutes. The convention of collective responsibility is the convention that Ministers speak with one voice on Government policy. It is why Ministers who don’t agree with Government policy and wish to speak out against it have to resign. It is one of the most common arguments against disclosure of Cabinet minutes in this country. However, as is often pointed out, the convention is regularly undermined by former Ministers and civil servants publishing memoirs, making ‘off the record’ briefings, and leaks. It is rare, some would say, that the views of individual Ministers are not public knowledge when it comes to the most controversial areas of Government policy. 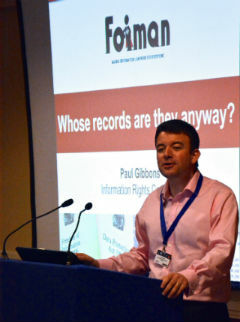 The Information Commissioner’s view is that FOI is a method through which conventions may be legitimately challenged. Conventions have never been set in stone – they evolve over time to reflect political realities. The other argument made by critics of FOI is that Ministers (or officials) can’t speak candidly because they are aware that their views might be made public. The Tribunal’s answer to this in a number of cases has been to point out that Ministers and their most senior officials are not exactly “shrinking violets” (to quote a phrase used in a comparable Tribunal decision looking at the BBC’s Board of Governors). Similarly, G.O.D.’s argument that the risk of disclosure undermines governance – because minutes have to be written in an anodyne way in case of disclosure – has also been countered by the Tribunal in the past, who argue that good practice should prevail over sensitivity. (The Tribunal dismantled a number of these arguments quite effectively in a case involving the then Department for Education and Skills in 2007; the arguments have been rehearsed many times since). The Ministry of Justice found it difficult to reach any conclusion on the matter in its recent Memorandum, so the evidence in support of G.O.D.’s arguments is clearly rather equivocal. 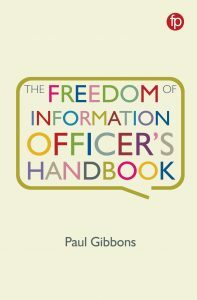 According to Eagles, Taggart and Liddell (Freedom of Information in New Zealand, OUP, 1992), who studied the New Zealand Official Information Act, the fear of disclosure has had little impact on the way that public employees and ministers express themselves in that jurisdiction. It is argued that this is because firstly, accurate records are necessary for these people to defend themselves in the future; and secondly, the risk of disclosure of any one document is actually very slight. This last argument reflects my own experience, and that of other FOI Officers I’ve spoken to. The biggest problem we have had is with officials who have been somewhat flippant in correspondence or notes and only realise the error of their ways when a relevant request is received. There is little sign that fear of FOI has inhibited their record-keeping. It seems to me that fears over Cabinet minutes are misplaced. I’ve looked at the Commissioner’s decisions in relation to Cabinet Minutes. The Commissioner has looked at 14 cases where s.35(1)(b) was applied in relation to Cabinet or Cabinet Committee minutes. Of these, half upheld the Cabinet Office’s view that the minutes should be withheld. The remaining 7 cases related to the Falklands War (which happened 30 years ago, let’s not forget), the Westlands affair (almost 30 years ago), Devolution discussions in 1997/8, and the takeover of Rowntrees by Nestle in 1988. The only decision that related to recent history was that ordering disclosure of some of the minutes recording discussion of the Attorney General’s advice in relation to the war in Iraq. And both the Commissioner and Tribunal made some convincing (to me at any rate) arguments in this case as to why the disclosure was in the public interest. They also made it clear that they viewed the circumstances as unusual. The Commissioner and the Tribunal have repeatedly, and reasonably, made clear that the public interest in withholding information will diminish over time. Is it really that odd that they would consider that it is reasonable to disclose Cabinet minutes nearly 30 years after they were written when the Government itself is committed to opening up Cabinet minutes after 20 years at some unspecified point in the (hopefully) near future? What always strikes me whenever I look at such decisions is that the Cabinet Office, to borrow the famous criticism of first world war Generals, are always fighting the last war. They keep spouting the same arguments against disclosure, even though the Commissioner and the Tribunal have repeatedly dismissed those arguments. And G.O.D. and his predecessors are repeating them again. Instead of parroting the same old arguments, or calling for FOI to be reined in, wouldn’t it be more productive for the Cabinet Office to examine previous decisions and work out a better strategy for protecting information where it really is necessary? It seems to me that in most cases, where they are able to demonstrate that there is a public interest in withholding information, the Commissioner is willing to listen. But what he can’t do is act as though FOI doesn’t exist in relation to Cabinet minutes. However much some would like that to be the case. Eat your heart out Gus! Well said! Hope you have put your submission to the post-legislative scrutiny to counter those politicians and civil servants who are now lementing the legislation they largely put in place.